In the next few short minutes you’ll discover how you can gain a competitive advantage over every other trainer and coach in your area helping your clients lose more fat, build more muscle and become better athletes by using one of the most popular training tools on the planet today! Over the past few years we’ve seen a number of training tools enjoy their moment in the sun. Some have merit, while others are nothing more than gimmicks designed to make the creators a quick buck. But none of these training tools can equal the combined benefits of quality flat continuously looped resistance bands. For years resistance bands were consider a nice alternative to weight training. Today Coaches, trainers, medical professionals, athletes and fitness enthusiasts have all become attracted and very excited about the diverse benefits that resistance bands can offer. Plus, compared to virtually all other training tools, resistance bands are incredibly inexpensive, conveniently portable, and are not age or gender specific. Which Would You Prefer To Carry Around? It’s really no wonder, or a surprise, that they’ve become the tool of choice for everyone from leading fitness professionals and strength coaches to stay at home moms and high performance athletes. With this growing popularity, there’s a rising demand for trainers and coaches to become educated and skilled on how to safely implement resistance bands. However, to date, all they have been provided is a mish mash of exercises that do not follow any logical or proven methodology or progression. It’s time to change that!! Starting today you now have access to the only Resistance Band Certification program available in the world that will provide you as a fitness professional or coach with the depth of knowledge and the breadth of skills necessary to maximize the power of resistance band training. 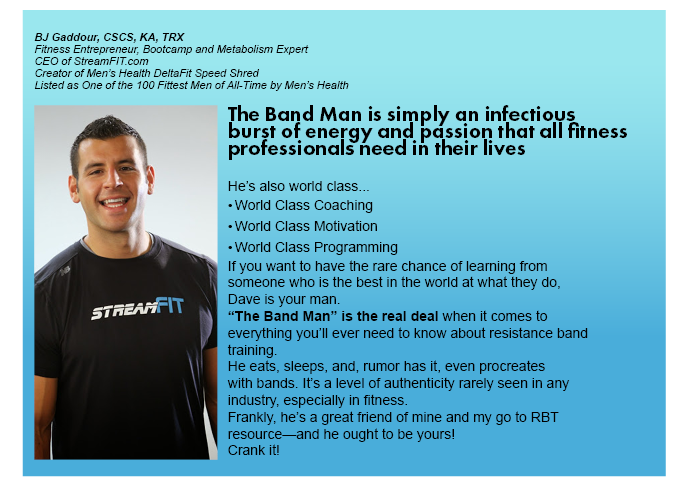 Introducing the First and Only Resistance Band Training Certification designed to make YOU a “Band Training Specialist” by empowering you with the teaching and training to create a Competitive Band Advantage while in the process getting Your Own Game Back!! 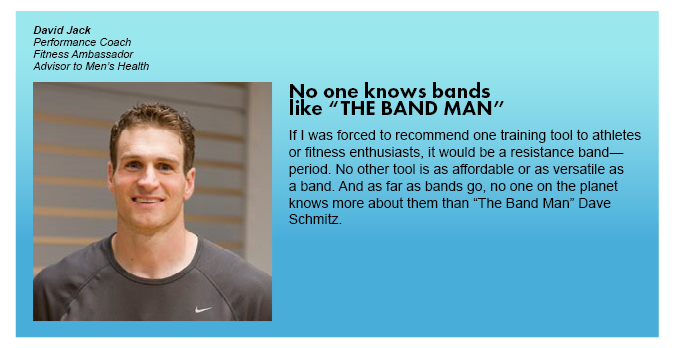 I know how frustrating it can be to have to sift through all of the information out there and decide what works and what doesn’t when it comes to training with bands. It’s confusing and almost always leads to developing less than optimal results or programs. What do you expect when to date bands were considered a nice “change of pace” or “a convenient alternative” to real weight-training. As a result, most so called band users never come close to understand or maximizing their real potential. In 1996 I was probably just like you, trying to figure out why, how and when. Trust me, it’s not your fault if all you have been given to date was a bunch of fun looking band exercises and left by yourself to figure out how not to hurt yourself or your clients while performing them. Heck, for about a year or so while first learning, I really wasn’t sure if I was getting any benefit from hours of training with band, until one day it all started to come together. Since then the momentum has continued to exploding forward and I know it will be the same for you once you just have someone provide you the blueprint. There is no better feeling than your athletes and clients getting better in literally days, as a result of YOUR new band knowledge and skill. During this time I’ve probably worked with resistance bands more than any other professional on the planet and through volumes of research and my own trial and error, I’ve developed the premier resistance band training “system” available today. I know I wasn’t the first guy to use bands but I am pretty sure I am the first to lay it out so you can now start building your own band legacy. Enhanced your teaching skills on dozens of powerful band exercises so you can fine tune your clients training approach and movement skills no matter if you’re training 1 on 1, semi-private or in a boot camp of 50. 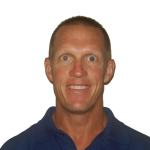 Gained a tool box full of beginner, intermediate and advanced exercises that will empower you to design programs that will deliver maximum “never seen or felt” results in a minimum time for ALL of your clients. 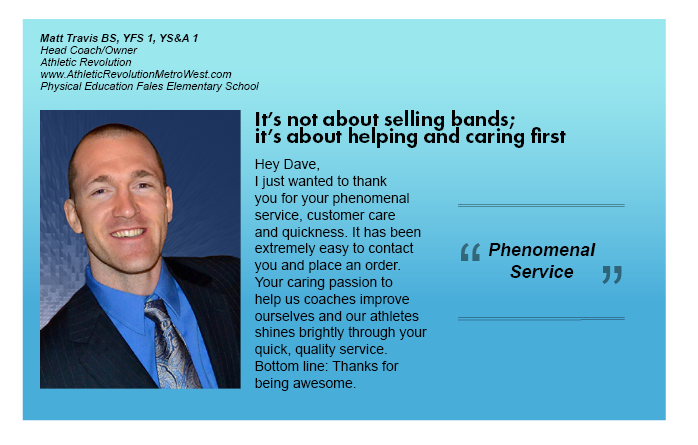 There is NO other professional resistance band credentialing like this available today. Plus, you’ll also be receiving Comprehensive Training videos that will teach you the mechanics of effective training and programming with bands. 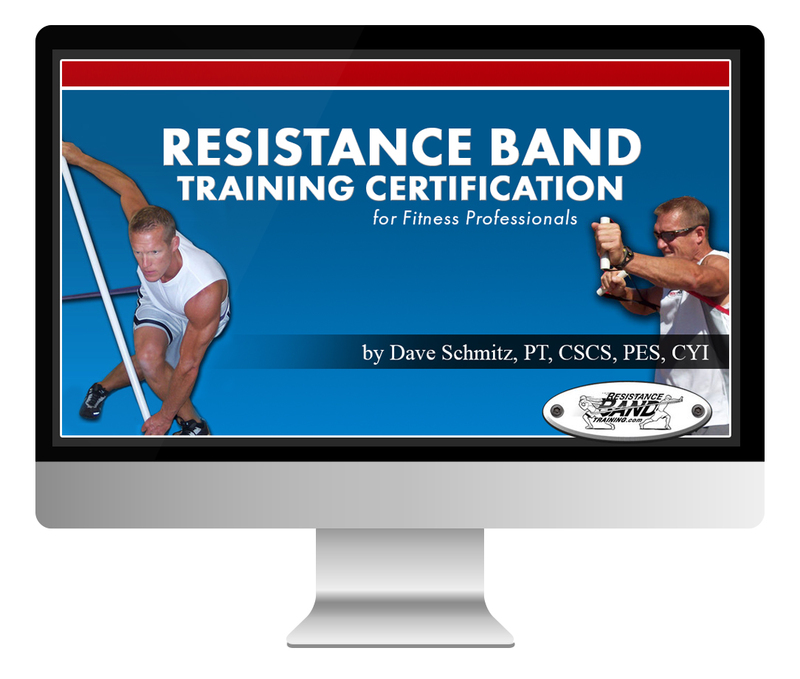 Together with your Resistance Band Training Certification Manual, you will have the most comprehensive band training educational resource ever created…and a distinct competitive advantage over your competition. As much as I would like to personally teach you at a Live Event, it is not practical and, frankly, costs too much. Therefore, this entire certification will be ship directly to your mailbox. NO Planes, No Waiting in Airports, No Rental Cars, No Hotels, No Schedule changes, No worries. I can’t wait for you to get started learning! While I realize this certification comes with a certain level of risk, fortunately, I have a solution for that as well. 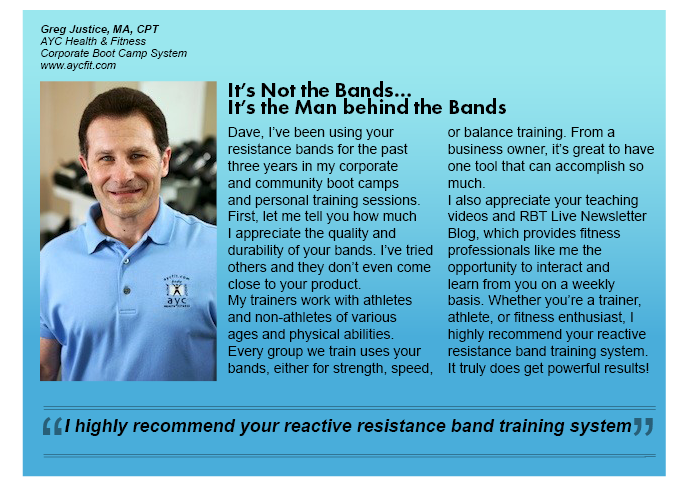 So if you’re serious about helping your clients reach their goals utilizing the most versatile training tool on the planet, you must get started learning and earning your Resistance Band Credentials Today—or risk falling behind the competition. Simply choose your package below to purchase the Resistance Band Training Certification. There’s absolutely no risk to you. Try it out for a full year. You have my 100% no-excuses guarantee that you’ll become a better trainer or coach. 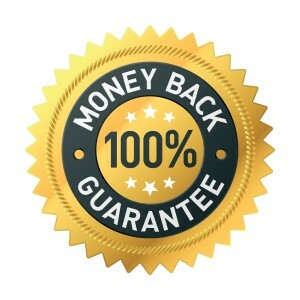 If you don’t agree that this Certification is all that I’ve said it is, you can send it back for a full refund. No questions asked. 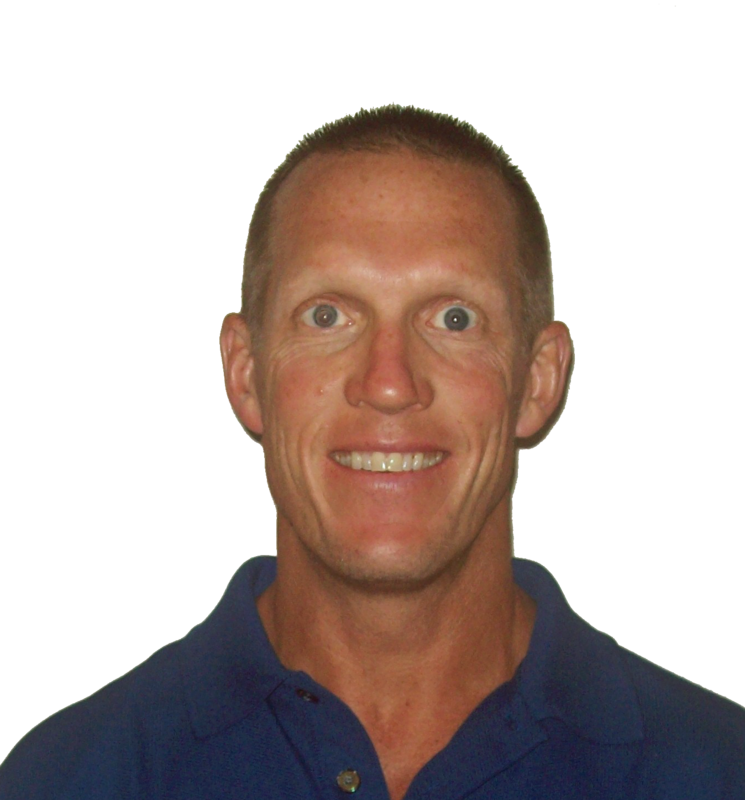 If you’re ready to gain the competitive band advantage over every other trainer and coach in your area, and you’re serious about dramatically improving your clients and athletes results, then I strongly recommend you take advantage of this limited-time opportunity today by clicking on the link below. 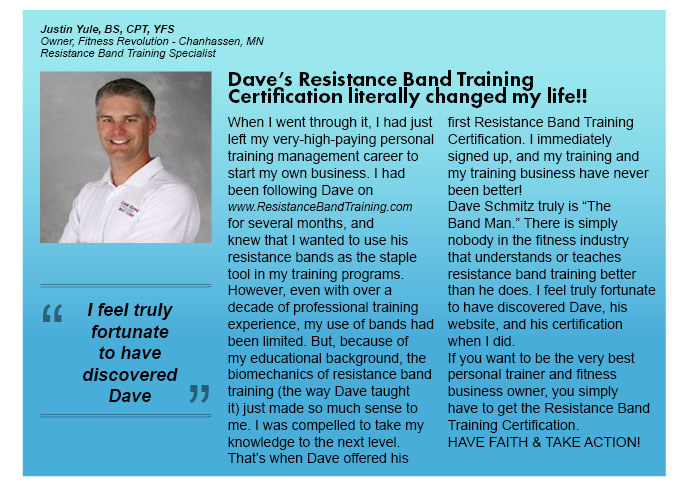 Become a Resistance Band Training Certified Specialist Today!